The dresser was left in our garage when we moved in, the mirror we pulled out of the trash, and the sconces were purchased for another project but didn't work out. The wall paint was also supposed to be leftover but I made a mistake and bought some supplemental paint that was a shade darker than what I had been planning to use out of my stash. It all ended up being Sherwin Williams Silver Strand. The curtains hung in our basement for awhile until I replaced them with some others that I fell in love with at Ikea. The nightstand is part of my childhood furniture set that is scattered throughout the house. The orange chair belonged to my Gamma (paternal grandmother). The lamp and teal pillows are more items that we had in our collection, leftover from our earlier lives. The desk is part of that same childhood set. The chair was purchased from the neighbors across the street - originally intended for a refinishing project but I've stolen it for myself for the time being. I had this dresser in our other guest room for awhile but I decided to move it out since it was a tad too big for the space. I love the wood grain veneer on the front. Please pardon the cords. Two new additions are this owl print (Rockfish Gap Antiques) and this gold framed box (Target). The gold box has pieces of coral that my dad harvested in Hawaii before it was illegal, and the owl print reminds me of my Grandpa, Henry. When he passed, my cousin Chip noticed an owl hanging around in the daylight and decided it was a sign that Grandpa was watching over us. I believe he is. These birds are another item we had in our collection, waiting to be hung. They were a gift from my Mom about 5 years ago and used to hang above our bed in our first apartment. They used to be black (someone once mistook them for bats!) but I spray painted them white and gold to match the room. This twin bed was mine in college. The London print over the bed was purchased on clearance at Pottery Barn and was the color inspiration for the room (gray, orange, teal, gold & white). The duvet was a new purchase from Ikea, as was the curtain rod, and the frames in this part of the room. This photo was taken by my dad when he was a student at Annandale High School. It fits with the bird theme (can you tell I like birds?). Another photo taken by my dad in high school. On the desk -- more vintage cat art from a family trunk full of photos and prints; a lovely quote by John Wesley given to me by a friend at church, and an angel given to me this Christmas by my mother-in-law. The wooden box behind contains all of my work files. Over the desk, these rails were purchased for another project but didn't make the cut. Here, they're doing their job keeping me organized. **Update: It appears that the video may have been removed from public view. I'll repost when it's up for good!" Last July, This Is Red (a local ad agency) took over our house for the day to film a commercial. Here it is! A couple years ago, I was at a coffee shop with an acquaintance, exchanging family war stories. We were sitting there comfortably, carrying on about our in-laws when all of a sudden, in one single aside, she said it. In my shock, I tried to manifest a look that said, “Oh, of course -- none taken,” and the conversation quickly moved on. Needless to say, I wasn't thrilled at the comparison. It’s not easy to hear that someone views you in such a way that diminishes your interests in life to just things, especially when your heart cares so deeply and desperately about people. Many years of reflection have finally brought me to a place where I realize and accept the fact that we, as humans, are undoubtedly and intrinsically linked to material goods. Just as I believe that we were created by God and are thereby connected to Him and one another, so do I believe that we are connected to the goods of our own creation. And just as we do, the goods that we create have the power to impact this world both positively and negatively. The dual influence of material goods of course deals with responsible manufacturing, consumerism, disposal & recycling practices, but I also see its impact in much broader reaches. In my life’s journey, I continue to find that the goods we surround ourselves with have an enormous impact on our psyches and consequently, our individual impacts on the world as a whole. In my work as a professional organizer, I see the negative and positive of material goods every day in the lives of our clients. Many times, our clients have suffered great tragedies and have turned to material goods to soothe their pain. Each individual item was selected because it reminded them of a little piece of good in themselves; brought some small amount of joy; represented a dream for themselves still to be realized or the potential for a better day, a better world, and a life more worth living. All of these individually are great dreams, until together the literal things overwhelm our clients’ environments and inhibit their ability to live their best lives. Our goal is to help them get to a place where they are still surrounded by things that they love, but in a balanced way that reflects their true selves and enables them to achieve their life’s true goals. Interior Design even further enhances these goals, by helping create spaces which inspire and energize them to go out into the world and live out their purpose on earth. In my own home, I repurpose used pieces to the best of my ability to conserve the earth’s resources, but arrange them and tweak them in ways that reflect my personal style and nourish my soul so that I can go forth and love others to the best of my ability. My wardrobe is ¼ of the size of the average American woman’s, but I try to spend time and dress myself in ways that make me feel confident so that I can give more of myself to others. Yes, appearances and things are important to me, because people are important to me. I show love to myself and others by helping them manage their material goods and create spaces that nourish their souls. Call me materialistic. **You may notice that there have been a few changes to my site (ie: my blog is now my homepage)! This is due to some very exciting business-related news! See my Facebook page for more details. In Pittsburgh, we have a little something called a Pittsburgh Potty. Sometimes it’s just a potty, sometimes it’s a full on powder room, and occasionally, there’s a shower involved. Generally speaking though, a Pittsburgh Potty is a toilet in the basement or garage. We first learned of the concept when we were house shopping and noticed that all of the MLS listings had a little line that said “Pittsburgh Potty: Y/N.” Most of the houses we toured had one and from what we saw, sometimes the potty is just sitting in the middle of the basement and sometimes it has its own room. I've been told they were intended for steel or coal workers to use to “wash up” before entering the house (how you “wash up” with just a toilet, I don’t really care to know). Lucky for us, ours came in the form of a little powder room with a sink off the garage. Our Pittsburgh Potty can only be accessed from the garage and since we’re really the only ones who use it, I decided it would be a good opportunity to do a little experiment and use up some leftover chalkboard paint from our kitchen and guest bedroom. Of course, the door had to be indicative of the magic inside. Nothing dresses up a Pittsburgh Potty like chalk molding and gold spray painted gallery frames. I pulled the frames from my collection of old frames, revamped them, and filled them with wallpaper remnants and free printables. Over the commode, I spray painted and hung an old plastic shelf that we inherited from the previous owners to hold necessities. The cost of this makeover? About $3 for those hand towels. Yep, $3 for the most spectacular potty in all of Pittsburgh. Be jealous! Happy Friday, y’all! Maybe you saw my post on my garage progress earlier this week. Today, I want to focus in on one of my very favorite organization elements - the dry erase pegboard! I simply ADORE it. If you know me, you know that I’ve had a pretty serious obsession with chalkboard paint for awhile now. I love it because it’s dark and dramatic, while simultaneously so flexible and fun. Naturally, I love dry erase paint because it’s pretty much the yin to chalkboard paint’s yang. I elected to use it in this case because I knew I was keeping the garage walls white, and I wanted the peg board to blend in. With all of the colorful tools that would be hanging on it, I knew that the pegboard needed to be as subtle as possible so as to keep the wall from being to visually overwhelming and heavy. The dry erase surface would also allow me to trace my tools and label them, ensuring that everything had a clear place and could easily be put away. As I mentioned the other day, I purchased reclaimed sheets of pegboard from Construction Junction here in Pittsburgh. They had quite a selection of sizes and in our efforts to select the most efficient combination, we inadvertently chose the only panels that did not have standard hole spacing (crap!). (most pegboard has equally spaced holes in all directions but ours was missing every other vertical column of holes.) Unfortunately, we realized too late so we’re living with it (it definitely made things tricky hook-wise but it does the job). A good rule of thumb for installing pegboard is to make sure you have about ½” of space behind the board to allow room to install hooks, etc. For large spans like ours, the easiest way to do that is to use 1”x3” furring strips. If you’re familiar with wood sizes, you know that the 1”x3” dimension is nominal. The actual size of these strips is about ½”x2-1/2". To install the peg board, I first installed the furring strips around the perimeter of the wall and up the middle, securing them using 1-5/8” Exterior Wood Screws. If you’re attaching these strips to a drywall wall, it’s a good idea to locate the studs and make sure you’re screwing into those. In our case, the outer layer of the wall was plywood so it wasn't quite as crucial. Once the furring strips were in place, Alex helped me trim he pegboard sheets down to size with a circular saw and we screwed them into the furring strips with the same 1-5/8” screws. The next step was primer. The pegboard had a black and white striped pattern on it so unfortunately, it took about 4 coats of primer and 2 coats of regular wall paint to get them white enough for the dry erase paint. Once everything was dry and I found a free afternoon, I got ready to apply the dry erase paint. I used Rustoleum’s Dry Erase paint which is available at most Home Improvement stores. It came in two containers - 1 quart of paint plus a small can containing an activating agent. The activating agent must be added to the paint and then thoroughly mixed, right before you start painting. Once the two are combined, you only have 1 hour to use the paint. If memory serves, the instructions promised that it would cover a 2’x7’ area but I covered about an 8’x7.5’ area and still had paint leftover. It wasn’t too hard to apply - it’s just a bit runnier than your average paint. I used a high density foam roller to achieve the smoothest possible finish and was able to do about 4 thin coats in an hour’s time. It took 3 days for the paint to cure and then I was able to start hanging tools and drawing on the walls. The final finish actually feels exactly like a dry erase board! Now, with all of the tools up on the wall -- it’s so easy to find what we need! I also love that my husband can easily find where things go since everything has been traced and labeled. Plus, as our tool collection grows, I can move things around and retrace if need be. Definitely worth the work! Our garage has moved freely through almost the entire spectrum of disorganization since we moved in two years ago. It’s housed everything from tile deliveries to water-logged couches and provided shelter for almost every furniture painting or sanding project I’ve undertaken at this house. It has seen it all. This little room is a trooper. Last winter, I managed to clean it up enough to be able to squeeze a car in, but the level of functionality in this space just wasn't quite cutting it. At the heart of the issue was this: it’s really hard to stay organized when you have nowhere to put anything. Last summer -- when we were demoing the kitchen -- I decided that I wanted to reuse the old kitchen cabinets. Half would go in the garage for tool storage and half would go in the laundry room. We carried them into the garage, lined them up against the wall, and there they promptly sat for a year. Fast forward to July of this year when my sister Jennifer came to visit -- the garage was a mess again and the countdown to winter was starting. Jennifer offered to help me get the project started by assisting me in establishing the necessary infrastructure to really get organized. My plan of attack was to 1) spend as little as possible, 2) reuse as much as possible, 3) make it beautiful, and 4) employ organizational systems that would allow my husband and me to access our tools quickly and easily. A key to accomplishing number 4 was creating “zones” within the garage. Near the door into the house, I reused previously-owned, stackable recycling bins to organize frequently used items (cleaning supplies, rags) and recreational items (sports equipment). A wall organizer holds our broom collection, many of which were left by previous owners, and an old dry erase board provides a spot for quick notes or inspirational messages. An upcycled flower pot becomes a go-to spot for pencils and dry erase markers. A large plywood wall became the perfect spot for consolidated hand-tool storage. With my mom and sisters’ help, we purchased pre-owned sheets of peg board from a local Architectural Salvage store, Construction Junction. I decided I wanted to paint them white (they were originally covered in heinous black and white pin stripes) to blend in with the rest of the garage and opted to try Rustoleum’s dry erase paint, knowing it would allow me to mark the location of my tools while permitting me the flexibility to move them around. Matching storage bins at the base of the wall provided spots for extension cords and other items in need of more containment. A large nook near the rear of the space was our best option for storing larger machinery like our lawnmower and chipper, at least until we’re able to buy or build a shed. Though it doesn’t look particularly organized, the space was carefully laid out to maximize the storage of large bulky items. A small cabinet mounted to the wall above houses lawn-related sprays and insecticides. The door to a small powder room (or “Pittsburgh Potty” as we call them here), painted with leftover chalkboard paint, provides a place to write down seasonal lawn or home maintenance reminders. The old kitchen cabinets were transformed into a beautiful workbench with a few coats of leftover gray paint, a little gold spray paint on the original hardware, and a $5 upcycled door from Construction Junction. Jennifer helped me attach wood cleats to the existing concrete block wall so it would be easier to install the wood cabinets (it’s easier to screw into wood when you’re trying to level and position cabinets against the wall). Alex and I used a circular saw to trim down a 30”x84” door which became the top of the workbench. The far right side of the long base cabinet used to be a blind corner in our kitchen, so I decided to leave it open and use self-adhesive wallpaper from Target to pretty up the back. Inside the cabinets, we’re storing all of our large power-tools and utilizing some leftover plastic drawers to hold miscellaneous hand tools, extra blades, and items not easily hung on the peg board. On top of the workbench, we sorted all of our miscellaneous screws and nails into easily accessible hardware organizers, all clearly labeled with typed or handwritten labels. The boombox (which I think I’ve had since elementary school…) is a must for any garage. The far left cabinet used to house our oven when it lived in the kitchen. I added a back and new shelf made out of wood scraps, and then added wallpaper to match the blind corner cabinet. To cut down on clutter, I poured paint from partially used leftover paint cans into mason jars (some large, some small). This also allows me to easily find and access touch up paint. In the bottom cabinet, I placed the majority of my painting supplies, as well as cans of paint that I’m still in the process of using. In the upper cabinet, I have all of my wall repair supplies (caulk, spackle, patches, drywall tape), and well as some adhesives and tapes. Along the adjacent wall (which still needs some work), ladders and bins containing drop cloths all fall within the paint zone. Overall, establishing infrastructure with zones in mind has resulted in a much more functional, beautiful, enjoyable garage space. I still have a couple walls left to paint but it's looking so much better in here. How about you? What zones do you have in your garage? How do you store your tools? About this time last summer, I was neck-deep in our kitchen renovation. The demo portion of the job started in April and lasted much longer than I anticipated, mostly because I was often working alone (picture me pulling upper cabinets off the wall in the direction of my face!). When I wasn't worried about knocking my teeth out (again) or dying alone under a pile of 100 lb vintage cabinets, I was really excited to uncover some clues about our home's history. My first discovery was under the oven cabinet. A Wally Walrus coloring book with marbles and bouncy balls out the wazoo. Clearly, children lived here! The next discovery came while my sister Amy was up helping me get ready to paint and tile. We spotted two small pictures stuck to the wall behind the counter. How about those jackets! We think these are school pictures of the two adorable boys who grew up here. Circa 2010, but with many original features. Our house was built sometime in the mid-sixties (we think 1964) by the Jones family. We are the third owners, but little was changed in the home by the family we purchased it from. From what I've heard, Mrs. Jones was very instrumental in the design of this house. For example, she was insistent that the house be situated so that the basement could have a large sliding glass door -- a feature which I love for the light it brings in. She had an affinity for bright paint colors, which I've discovered in little leftover spots around trim and behind outlet covers. She also seemed to have generally bold, fashion-forward style all the way around. This picture of our kitchen with its bright turquoise counters (which is not totally representative of what it looked like when we bought it) is a pretty good indication. I love that she and I share some favorite colors. Another fun discovery, though not related to our house or the Jones family, came later last summer in a Goodwill purchase for our patio. My older sister, Jennifer, came up to help me wrap up a couple kitchen projects and update our patio. She spotted this mid-century piece at Goodwill and suggested I use it for outside storage. It was the perfect size and in such bad shape that I didn't feel guilty about putting it out in the weather. While I was prepping it be repainted in black exterior paint, I found this sweet Father's Day note for its previous owner. I think the signatures read "Dan, Sheree, Damian & Harmony." I know that the sixties were not all that long ago, but it's still been fun to discover these little reminders of a time gone by. All of my best wishes to the Jones children and their families, wherever they are these days. It's hard to believe that we've owned this house for 2 years. It's almost hard to remember what it looked like in here when we bought it. Take for instance, one of my more recent projects: the master bedroom. 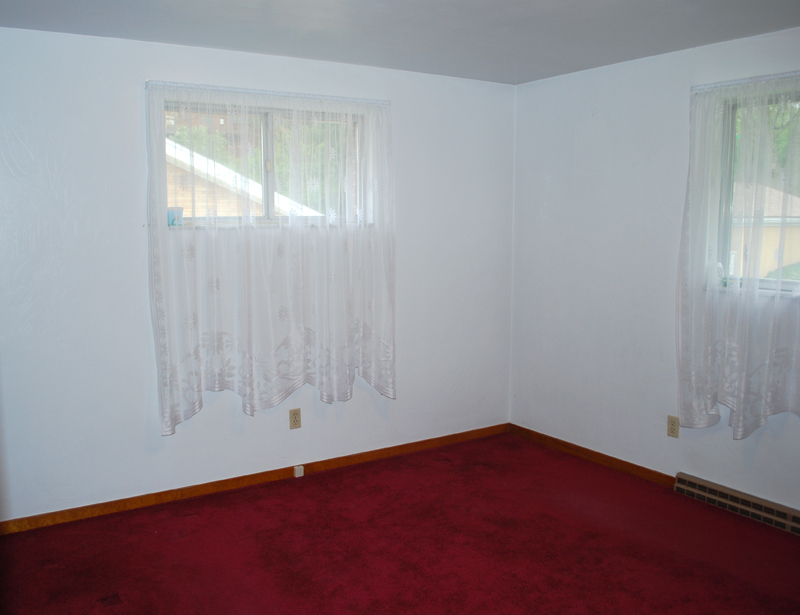 Dark red carpet, orange-y wood trim, and lace curtains. It's a distant memory! After we moved in, it looked like this for a long time. We replaced the lace curtains with bamboo shades early on, but our nightstands were closet organizers (leftover from my makeshift college desk) for over a year. The color inspiration for the room came from this bird pillow that my paternal grandmother made. My initial plan was to paint the room mint green but I ended up settling with a lighter shade of yellow green (SW 7728 Sprout) to coordinate with the leaves in the textile. Truthfully, I'm still not totally sold on the color (it's looks kind of lime-y sometimes) but am feeling infinitely better about it since spotting this amazing bird print at Ikea. The background color on the print on the far left is, coincidentally, exactly the color of the walls and the piece overall ties in the rest of the room. In addition to the wall color, another major change to the room are the wardrobe cabinets on either side of the bed. I love these. They were part of my plan for the room since the day I first laid eyes on the closet. I had seen similar wardrobe installations by other bloggers (like this) and thought they would be the perfect way to add extra storage, while creating a cozy, built-in feeling. These particular cabinets are part of the Besta series from Ikea which is a more versatile line that can be used for anything from media storage to clothes storage. I selected these because they fit our space and ceiling height better than some of their other traditional wardrobe lines. They're not quite deep enough for side-by-side clothes hanging but are great for folded sweaters, jeans, etc. I opted for a smaller door at the bottom and a few open shelves in the middle for accessories and nightstand items. Eventually, I'd like to find wallpaper to line the back of the shelves with. I'm thinking something like this. The only downside to these particular cabinets was that they weren't quite wide enough to reach the edge of the bed. We ended up purchasing a new, low platform bed frame (Ikea Malm) to accommodate the bird print above the bed and were having a hard time finding small, low nightstand solutions to fill the 11" gap on either side. My solution was to use a small antique table that I inherited from my grandparents on one side and stack some books on the other side (a la the January 2014 edition of the West Elm Catalog). In the way of clothes storage, we're still using the mid-century modern dressers that I've had since childhood. My dad built them from a kit in the 60's and they're really in need of some TLC. I'm thinking about trying a gel stain on them. Then, of course, there's the closet. It needs a new rod but it's looking much more upscale these days since we replaced our mismatched hangers with brand new wooden ones. 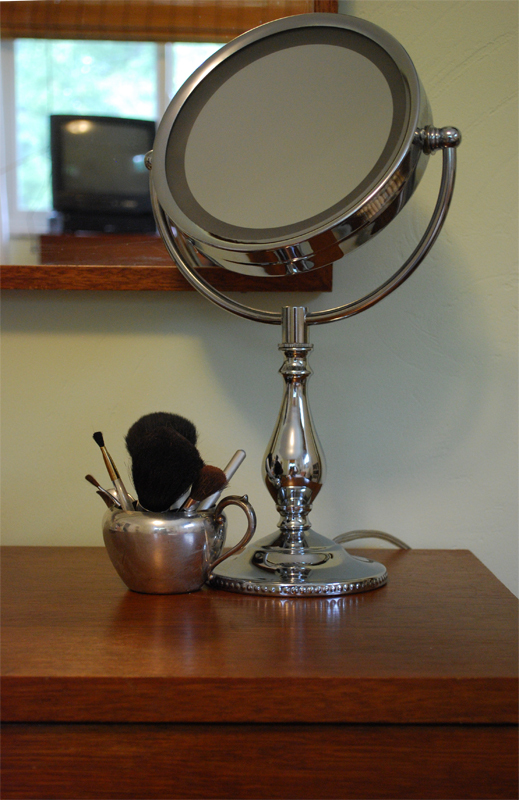 On my dresser, I store my makeup brushes in an upcycled silver cream pitcher. My necklaces are hung on an antique ladder which makes them both easy to retrieve and doubles as art! Speaking of art -- on this side of the room, I hung my maternal grandparents' curio cabinet (filled with a few pieces of my paternal grandparents' stationery from their time in Uruguay), a print of my favorite childhood restaurant, and an antique print of our alma mater which I think belonged to my Great Uncle Bill. On this wall, I hung a beautiful custom piece by my talented uncle, Ted Lind, which was given to us as a wedding gift. Adjacent to the closet is a handpainted portrait of my dad (as I prefer to remember him) at the age of 6. It was commissioned by my grandparents when they lived in Poland. Not too bad, but nothing spectacular. We decided to replace the toilet (which was kind of an ordeal - don't order plumbing fixtures off the internet!) because the old one was leaking. I also installed some glass shelves over the toilet because we have no under sink storage. Eventually, I'd like to at least replace the sink with a shallow vanity and repaint. Altogether, it's coming along. There are still a few things on my to do list but it's definitely an improvement!